Michigan football sexual assault case: Reminiscent of concussion story. 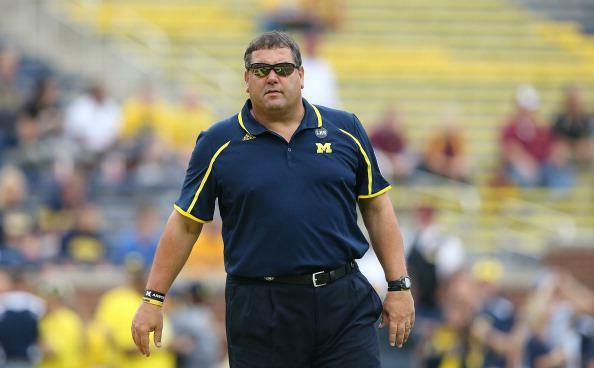 Though it doesn’t seem to most observers that Brady Hoke will or should be Michigan’s football coach for much longer, some pundits have charged that the mishandling of quarterback Shane Morris’s concussion this weekend—only after approximately 60 hours, and repeated denials, did the athletic department admit Morris had played while concussed—is being taken out of proportion by fans who are merely angry that the team is losing. But as Sports Illustrated writer George Dohrmann noted on Twitter yesterday, the Morris fiasco is not an isolated incident: A similar story of obfuscation played out last fall when Hoke lied about the status of kicker Brendan Gibbons, who was expelled when the university found he had sexually assaulted another student. The Michigan Daily reported that the associate director of the school’s Office of Student Conflict Resolution (OSCR) signed a letter dated Nov. 20, 2013 that detailed the finding that Gibbons had committed sexual assault. Three days later, he kicked three extra points in a game against Iowa. On Nov. 30, Gibbons did not play in the Wolverines’ season-finale against Ohio State because of what Michigan coach Brady Hoke called a muscle problem. Gibbons was notified in a letter dated Dec. 19 that he was dismissed from the school, according to The Michigan Daily. Then, on Dec. 23, Hoke announced that a “family matter” would prevent Gibbons from playing in the Buffalo Wild Wings Bowl. It’s unclear if Gibbons was actually injured before the Ohio State game—a spokesperson said that detail could not be discussed because of privacy issues after the news ultimately came out that he’d been expelled. (Which doesn’t make a lot of sense—if it was OK privacy-wise to say he was injured in the first place, why wouldn’t be OK to then say he wasn’t?) But it’s certain that saying a “family matter” prevented Gibbons from playing in the bowl game after he’d been expelled is a complete misrepresentation of the situation—and a valid reason not to give Hoke (and other school officials) the benefit of the doubt as they deploy the same “ignore, then dissemble” tactics during this current mess.